As I wrote in the live chat, it was a big surprise to me that they opted to tear down the Safety Center and build a fire station there. On the tour last Friday, Jerry Anderson said that he’s heard NO support for that option. I still think Option B would be a lot simpler and cost-effective, ie, gradually renovate the current Safety Center into an expanded Police Station while building a new fire station. It was discussed but it wasn’t clear to me where the fire facility would temporarily go for a year while the Safety Ctr is torn down and the new fire facility built. Anyone know? 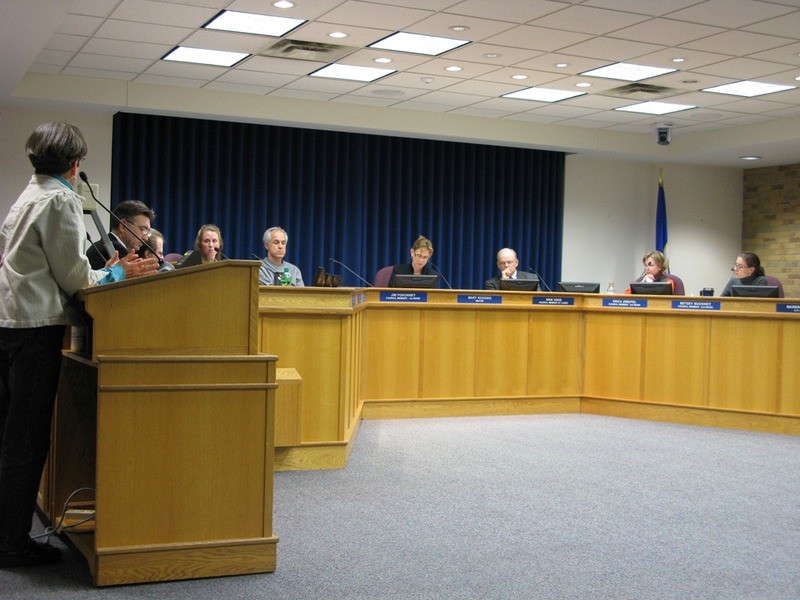 KYMN news director Scott Peterson’s news update today (text) covers last night’s council meeting. Griff: What were the votes? David, all votes but one were 6-1 with Denison dissenting. The timeline vote was 4-3 with with Pokorney, Zweifel and Denison voting no. Griff : In reply to your question in #1, Mr Walinski suggested last night that the fire equipment could be temporarily sited at the new “cold storage facility” that is to be built as an unheated space that was presumed to be for storage of excess water dept and engineering equipment that could be in that sort of space. The approval for this storage space was given by the council a couple of weeks ago; at that time there was no talk of it coming in handy for a temporary fire station. Last night, Mr. Walinski said the staff did not bring the storage facility to the council for approval until… and I couldn’t hear the rest of the sentence. But now, with no mention of it before, it is suggested as a possible temporary home for the fire station. After the meeting Councilor Zweifel said she knew nothing of this and wondered if it had been discussed at a meeting she missed. Where do these decisions get made? Kiffi- These are really good points you bring up. I seems this whole town was laid out according to whatever pattern was in vogue at the time a new addition was platted. We have a combination of grid system, culs-de-sac, and large looping streets. At least it is not as bad as Eden Prairie, but the horse is already out of the barn. you are correct that there is no good universal route across this city. I didn’t get a chance to go to any of the task force meetings, but the thing that stood out to me in the council discussions was the need for the fire station to be more centrally located. One scenario that comes to mind with the eastern edge of town location is a fire at, say, Cardinal Glass. Just as the firetrucks approach the Hwys. 3/19 intersection, a BNSF train shows up at the crossing. So, do the trucks go up to the Greenvale overpass to get around the train and then travel down Lincoln? I would hope this scenario was addressed by the task force in their recommendation. I know that every possible problem cannot be solved with any one particular proposal, but locating the fire station on any edge of town will encumber quick responses to a call. After listening to Mayor Rossing, it is not clear why the Council rejected both the Majority and Minority reports. Griff: Is the recommendation that was in the City Council packet available on-line? While it is not listed as being in the packet on the November 16 meeting notice, it is Number 9 on the Regular Agenda, meaning you have to scroll down past the items earlier in the meeting. Jane: Thanks for the summaries. Sat. Nfld News editorial: Case for splitting facilities isn’t clear. The Gleason family donation of land to the city is generous. And the city should take advantage of it. But the council still hasn’t sufficiently proven to the public why two facilities are cheaper than one. Sat. Nfld News article: Board approves demolition of two buildings. In the Nfld News on Wed: Chiefs react to council’s split, cut. Police Chief Mark Taylor and Fire Chief Gerry Franek say their department operations will not be hurt by the separation, but said the split could increase construction costs. A joint facility would share mechanical equipment and work spaces, and those efficiencies would likely be lost with separate sites.